The 24-year-old Spaniard is clearly the best player on the planet, but even more remarkable than his relentless game is the fact that success hasn't gone to his head. He's actually . . . nice. To everybody. March 14, 2011, 9:50 p.m.
Rafael Nadal made his way into the round of 16 at the BNP Paribas Open on Monday with an impressive victory over a qualifier. He looked sharp, healthy and ready as always to make runs at the major titles. However, you don't always see the best of Nadal on the tennis court. Sometimes, that happens in the cafeteria line. The organizers of this long-running event did an interesting thing when they built their 16,100-seat stadium, called it the Indian Wells Tennis Garden, and opened it for play in 2000. They set aside a dining area not just for the players, but also the media. Yes, the greats would dine with the great unwashed. Arguments and fistfights were predicted. None have occurred. And so it came to pass on Saturday afternoon that a reporter found himself in the checkout line directly in front of the No. 1 men's tennis player in the world. The lines were long and both reporter and Nadal had been waiting for several minutes to get to one of the cash registers. As the checkout woman rang up the reporter's food, she reached for a little sign that read "Line Closed" and put it down right in front of Nadal. It was her break time. She didn't care if the queen of England was waiting. It was one of those "don't you know who I am?" moments. Many of the athletic stars of our time would have made that clear. To many of them, rules are for other people. He broke into a big grin, tapped the reporter on the back and congratulated him on being the lucky one. Then he started to look for which of the remaining long lines he would try next. The reporter, perhaps subconsciously trying to bag an exclusive interview sometime down the line, told the checkout lady, "No, no. He's important. Let one more go through." And so she did, after rolling her eyes like somebody knowing she was dealing daily with a roomful of huge egos. Nadal, who never stopped smiling, patted the reporter on the back and said something in his delightful Spanglish that meant thanks. It was no big deal. Yet it was. In sports, there are superstars who are jerks and there are those who become even bigger superstars because they understand they can't afford to be jerks. And then are those who don't even have to work at it, who were raised correctly and remain that way despite the adulation and trophy collecting. Nadal is such an athlete. He refuses to accept that his excellence at hitting a fuzzy yellow ball gives him a pass on decency and good manners. He ended the first set in his 6-3, 6-1 victory Monday over Ryan Sweeting with an ace down the middle and made sure to gesture to the linesman at the other end that he was sorry he hit him with the ball. In his interview session afterward, when the moderator cut off a questioner so that the interview could change to questions in Spanish, it was Nadal, not the moderator, who gestured and apologized to the reporter who had been cut off. He won't be 25 until June 3, and he has already won nine major titles, including the remarkable achievement of winning at least one of each. And yet, if you ask him about aiming at Roger Federer's record of 16 Grand Slams, or even hint that he is in the same tennis stratosphere as Federer, he will quickly tell you that "Roger is better. Sixteen Slams is too much." By its very nature, pro tennis is a self-centered, ego-driven pursuit. If you don't think you are good, you won't be. If things go wrong, find a reason other than your own failings. That's how it went earlier in the day, when fourth-seeded Robin Soderling of Sweden was upset by Philipp Kohlschreiber of Germany. Afterward, Soderling said that an injury he had was too problematic and he should have been smart enough to not even try to play. That's fair, probably accurate. But in the same situation, Nadal would have limped into the interview room, praised the other player, assured everybody that his limp had nothing to do with the result, and then had a cast put on out of the sight of everybody. Monday was a day when No. 1 woman's player Caroline Wozniacki sailed on easily, as did Maria Sharapova. It was also a day when the run of young U.S. player Donald Young came to an abrupt halt at the hands of veteran Tommy Robredo, and Juan Martin Del Potro showed more of the pre-injury form that took him to the 2009 U.S. Open title. It was also a day when Federer and his gold-medal doubles partner, Stanislas Wawrinka, packed an outside court as day drifted into night. But Nadal, with his sharp-angled ground strokes and unmatched power from every spot on the court, was the main attraction. The on-court announcer, knowing great tennis when he sees it, said so and praised Nadal afterward. 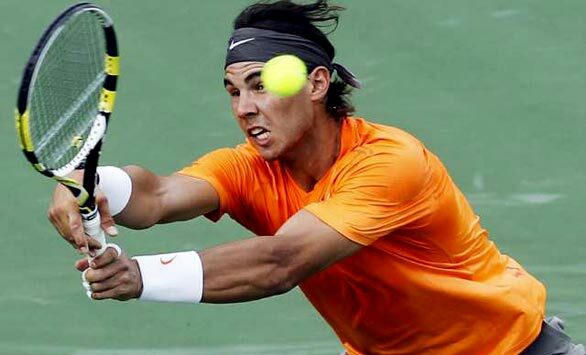 Nadal responded, "I am trying to play my best all the time, but sometimes it is good and sometimes it is not so good." Then he ducked his head shyly, like somebody embarrassed to keep talking about himself.